We had a wonderful Thanksgiving Day. The day started out so special. Two little girls woke me up saying, “Mom, we made cinnamon rolls for you.” My first words, “You used the oven? Did you use the pie pan?” (they turn out best in the pie pan!) Of course. Yes, they are 12 and 10 and quite capable of cooking, but this mom is always afraid to let them because I’m afraid they will get hurt/burned. I want to be there to watch every move they make to ensure their safety, and I have to admit, perfection. I have to tell you this precious action of theirs has to be credited to my husband, Brian. He’s not afraid to let them try things like I am. He loves coloring outside the lines!! Now, our dining room table is fairly new. It is the nicest dining table I have ever had. When Brian and I first married, he was an enlisted airman in the Air Force, and believe me when I say our pay was little. I was thankful to have a small table all those struggling years; buying a dining table was not high priority. We actually didn’t have a dining table until a precious elderly friend passed away and left us a monetary gift. When we lived in Fort Worth some twenty years ago, she was our neighbor. Brian always mowed her yard for her and wouldn’t take a dime from her. She found a way to pay him back!! So with that gift, we decided to buy something that we needed, that would be around a long time, and that would always remind us of our precious neighbor. That was our dining table. 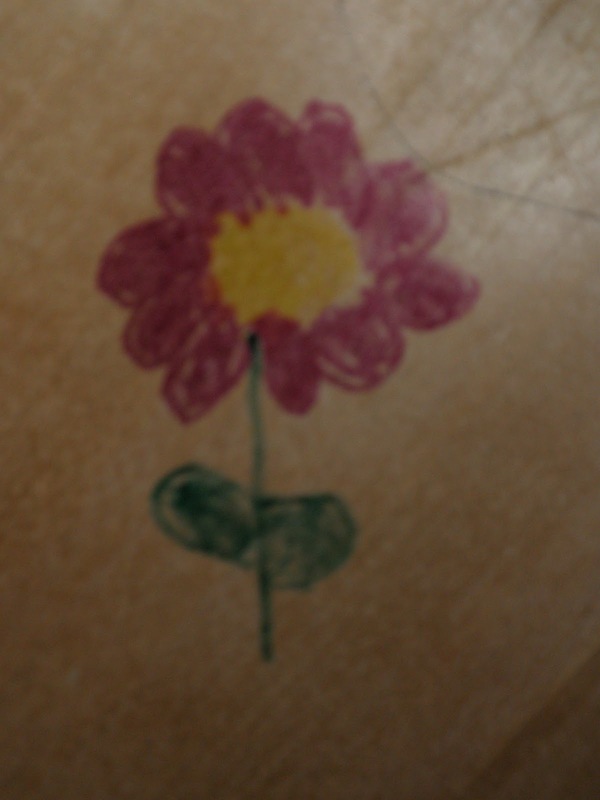 Color on the dining table? Really? I’m such a color-inside-the-lines type of person, but I’m so thankful for a husband who loves to color outside the lines. 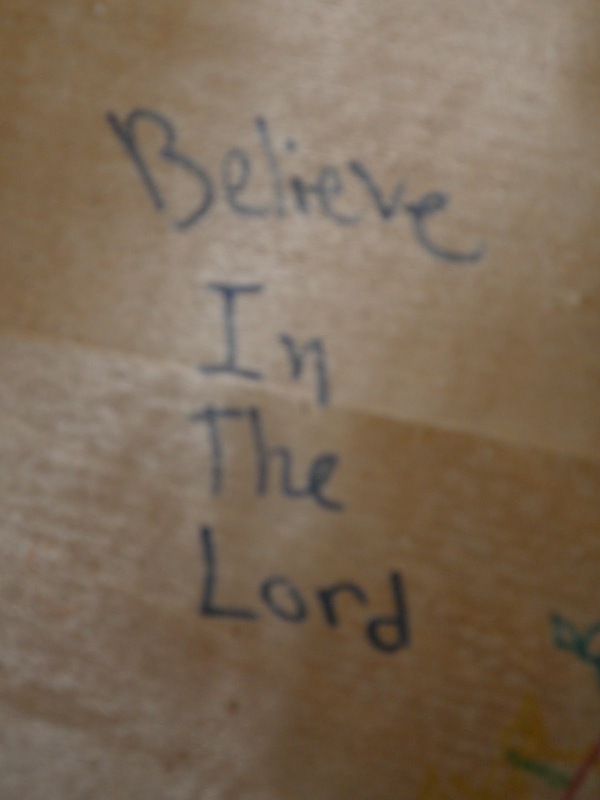 When my eyes focused on “Believe in the Lord” … I knew this was the beginning of an amazing Masterpiece. Karalee will look back at this one day and see that her thoughts were on God that Thanksgiving Day. And I’m so thankful that my color-inside-the-lines personality didn’t cause me to miss out on something so special. Color outside the lines? You bet! This is such a precious story Shelli. I can so see Brian saying this…he's a real sweetheart!! Come and see us sometime!! Jan, your comment means the world to me. You mean the world to me. You were always sweet to me when we were kids. I love you! Shelli Ann, so beautiful!! I can see you and Mr. B crawling under the table when you are 80 years old marvelling at all the new drawings that your girls and their babies have added over the years. Love you so much precious friend!! Okay, Lucrecia … you brought tears to my eyes! Who knows … those grandbabies might be your grandbabies, too!! 🙂 Oh, please, Lord Jesus, give us grandbabies!! !